Hemel Hempstead’s restaurant scene is not particularly awash with fine dining establishments but The Marchmont Arms in Piccotts End is surely the jewel in the crown. This beautiful converted stately home sits nestled amongst idyllic countryside on the outskirts of the town and in truth it doesn’t feel like you are in Hemel Hempstead at all. The 18th century building, which was a private residence for more than 200 years before being converted into one of the most stunning pub restaurants in a 20-mile radius, has more than a touch of Downton Abbey about it. The Marchmont Arms building is so impressive you will want to read up on its history. In short it was built in the 18th Century by Lord Marchmont. But there is nothing antiquated about its interior or the menu. Inside Marchmont you are greeted by fresh food, warm hospitality and a stylishly modern decor. The restaurant boasts lots of cosy nooks and crannies to enjoy your meal in with a lovely roaring open fire as the centrepiece. There are also several areas, including a large luxurious conservatory where you can get together with a big group to enjoy a special occasion. You will be in awe of the setting but The Marchmont Arms is not a snobby establishment by any means. The atmosphere is relaxed and the buzz of conversation fills the air, as does the dulcet tone of a saxophonist from the bar areas on the last Thursday of every month which is a really nice touch. The Marchmont was very busy which is always a sure sign of quality and consumer confidence and had a wide range of clientele enjoying its new menu launched this month. 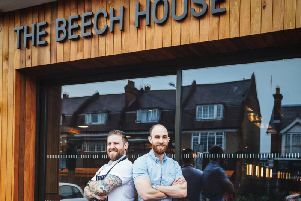 Prices are reasonable working out at around £40 per head and the food – whether it is the delicious burger, home-made spiced lamb koftas, slow-cooked pork belly or four-bone English rack of lamb – is full of flavour and comes in hearty portion sizes. Of course you don’t have to eat, the Marchmont Arms is also somewhere to meet for a beer or after work drinks. But there is a range of sharers and nibbles available should you inevitably get hungry when you see all the wonderfully presented food being delivered to the restaurant tables. Despite being extremely busy service was on point and the staff were polite, knowledgeable and attentive without being intrusive. Many of Hemel’s restaurants are geared around the desire for quick and easy food, not that there is anything wrong with that. But The Marchmont Arms surely takes the prize as the best the town has to offer. The unique dining experience coupled with wide variation on its enticing lunch and dinner menus make it a must for anyone that is yet to give it a try. Whether it is a special occasion or just quality food and drink you are after you won’t be left disappointed, or hungry, at The Marchmont Arms which true to its roots really is the stately home of dining excellence in the area.